Idli's are one of the healthiest breakfasts of Karnataka. There are many variations in making this idli. This Mallige Idli recipe is from one of the restaurants, a small one, in Mysore. They prepare amazing Idli and Coconut Chutney. Wash and soak urad dal in 1½ cups of water for 3 to 4 hours. Now transfer the batter to a big vessel and add salt. Mix well. Cover it with the lid and let it ferment overnight. To do so, warm the oven for a minute (don’t forget to turn off) and keep this in the oven. 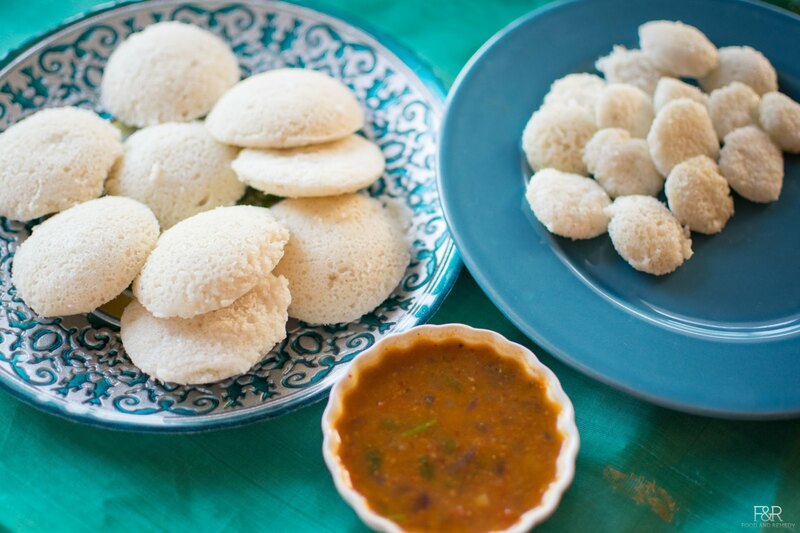 Try this Idli recipe with coconut chutney recipe from the same restaurant in Mysore. i have one doubt.. do v have to increase water quantity when v add more urad dal like for 1 cup of urad dal, 3 cups of water ? Yes, soak 1 cup urad dal in 3 cups of water and use the same water to grind. Depending on the desired consistency, if needed, add more water. You are doing a grate job by sharing all these recipies. Thanks Vinod Pallath for nice comments. Thatte idli recipe is same as idli, only difference we use the thatte idli stand to make the idlis in the shape of thatte. The batter is same. Thanks Archana for your feedback! i really love watching and making the authentic south indian food from your blog. my query is, what is d quantity of the d dal for ‘whole urad dal’ n ‘idli rice’, to be made in d grinder? Regarding urad dal, quantity is same whether you use whole or split urad dal. Rice quantity can be increased to 3 to 4 cups depending on the weather where you live. Can you please share the recipe for uddina vade? Hi is there a specific kind of rice to use to make soft and fluffy idlis or any kind will do ? Actually you can use sona masuri or idli rice or any rice you use at home . Can i use normal Sooji rava in place of Idli rava? What’s the best substitute for Idli rava? you can use sooji rava. raagi flour, check out he raagi idli recipe too. Made this idli.. it came out really good.. Thank you so much. I live in California and weather is cold during December and January. Do I need to do anything different for fermentation? Sometimes batter doesn’t ferment well. Glad to hear :) I am also in CA :) You warm the oven turn off the heat and keep the batter. That will do the job. That restaurant is not there any more, it was closed loong back! I moved to US almost 25 years ago, I don’t know any popular restaurants in Mysore.